In less than a week, we bust out yet another KILLER interview. After an epic time with master composer Lalo Schifrin just last week, we bring you our one-on-one with composer JORIS DE MAN. One of the most anticipated games of early 2009, has been KILLZONE 2 for the Playstation 3. Early buzz as been very positive and, just like it's predecessor, KILLZONE, a lot of positivity has centered around the game's musical score - provided by de Man. 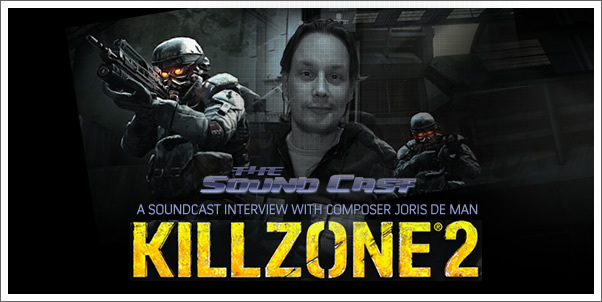 We spent a few minutes talking about his experience on KILLZONE 2 in contrast to the original KILLZONE and what it was like working with the LONDON SYMPHONY ORCHESTRA and recording at Abbey Road Studios. Don't miss the exclusive musical peeks from the JORIS DE MAN's original score and our discussion on the possibility of an official soundtrack release! I was in contact was his agent. Sony has planned a commercial release of the score. A release date isn't been known as this moment. Pitty the audio clip won't work, I'd like to hear this. @mjward - it seems to be working fine. What sort of error are you getting?